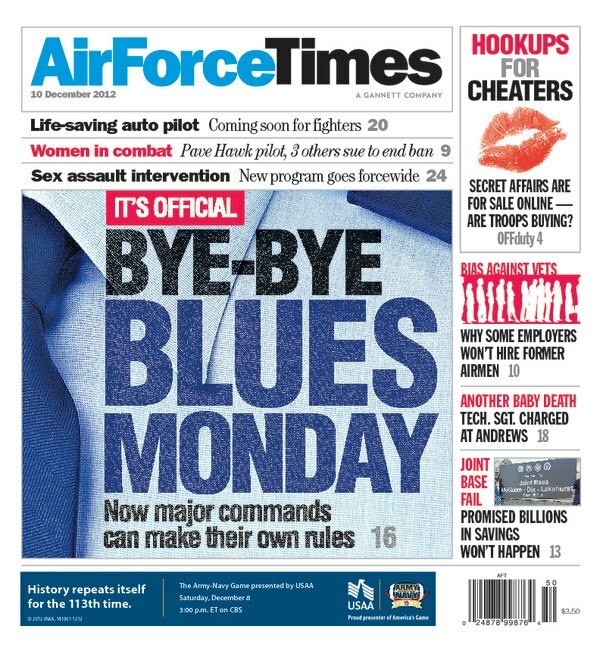 Four major commands have ended the unpopular “Blues Mondays” policy after the chief of staff allowed commanders to decide whether to continue to require airmen to wear dress blue uniforms on Monday. Air Force Materiel Command, Space Command, Special Operations Command, Pacific Air Forces have opted to ditch Blues Mondays outright. Meanwhile, U.S. Air Forces in Europe, Air Combat Command and Air Mobility Command have delegated the decision to wing commanders. In more somber news, the number of suicides among active-duty, Guard and Reserve airmen rose to 71 in late November, exceeding the number of suicides recorded in 2011. By last November, 56 airmen across the active force, Guard and Reserve had taken their lives. The worst year for suicides was 2008 when 80 airmen died. Meanwhile, the Air Force plans to equip F-16s with automatic crash avoidance systems that are designed to pull a jet out of an impending ground collision. The system is expected to save 10 pilots and 14 aircraft for the rest of the F-16s’ time in service. It is slated to be installed on 620 F-16s in 2014. And the Senate has proposed $5 million in funding for the dilapidated Clark Veterans Cemetery in the Philippines, which was covered in a foot of ash during a 1991 volcanic eruption, just as the U.S. military left the country.